Wow, this winter has been one for the record books with almost 4 feet of snow on the ground and some of the best snowpack on the trails that we have seen in a long time. Wow, this winter has been one for the record books with almost 4 feet of snow on the ground and some of the best snowpack on the trails that we have seen in a long time. The trails will hold up for a long time. As I write this report, the road crossings have not melted at all and they look like they do in the middle of January. Most projects are still reporting that they are grooming on a regular schedule, while there are a few that will slow down a bit, but not to worry — there is enough snow to sustain the trails for quite a long time. Eventually we will start to see some warmer temps, and with this comes the thawing process. Brooks and streams will become dangerous to cross, so please use caution. Some of the best riding is right now, and if you can get out and ride you should take advantage of it and do it. ITS 92: This trail is in good condition. ITS 90: This trail continues to be in great shape. There is a logging operation about 2 miles from the Woodland road crossing near Caribou. It is marked; watch for log trucks. Fort Fairfield is reporting good conditions. Portage is reporting a small logging operation near the Beaver Brook Bridge; please use caution. This section of logging is very well marked. ITS 120: This trail is in great condition and one of the most scenic rides in The County. ITS 83: Reporting good conditions. The logging operation is now in effect and the reroute is now open. Please watch for signs and plan accordingly. There is also a new logging operation in Monticello south of the transfer station road; watch for signs. Night trucking has started, so please be cautious. Madawaska is reporting they groomed their section on Wednesday and it is in great shape. ITS 81: This trail is connected all the way through. There is a logging operation on the section in Grand Isle; please watch for signs. There is a logging operation where trails 98B and 81 intersect; watch for signs. Madawaska has groomed their section and is reporting very good conditions. All clubs are out on their sections. ITS 85: Groomers will be out from North to South before the weekend. Oxbow is reporting that they have groomed this section twice this week. ITS 105: This trail is in good condition from Van Buren all the way through to Scopan. Washburn is back up and running, so they will be on their section. ITS 88: This trail is in great condition. Trail 61: Being groomed and in good shape. Trail 89: This trail is open to the Black Bear Lodge and connects with trail 102, which is the old trail 100 that Pleasant Ridge Riders maintain. From this intersection North to 94 still has not been connected. Trail 71A in Ashland is now open to the river. There is one mile of plowed road; other than that, this trail is awesome. ITS 86 has been groomed this week and is reported in good shape. Grand Isle is reporting that their system is all groomed and in good condition. Frenchville is reporting good shape on their trails. Sly Brook Snowmobile Club are reporting good conditions on trail 96 and 73. As of Friday, the rest of 73 and 73A will be groomed. Trail 71D is closed for the season, as there is logging, — this is in the Grand Lake-Seboeis area. Municipal trail 70 Benedicta/Whetstone Falls is closed due to heavy logging. Trail 81: Nordic Lakers are reporting good conditions. 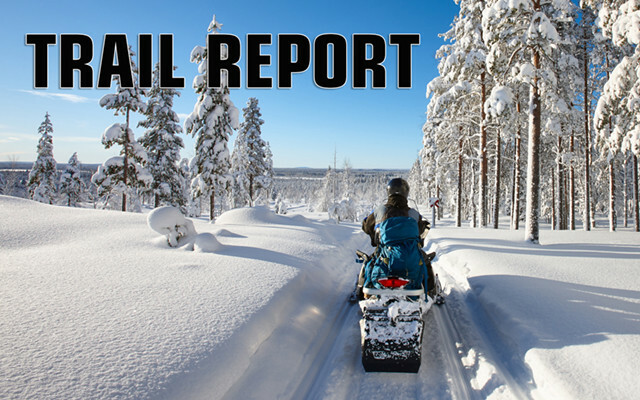 Easton Snowmobile Club is reporting their trails are in good shape. Trail 73 and 73B is being maintained by Fort Kent. Central Aroostook Snowmobile Club are reporting a lot of Moose traffic on the Number 9 Lake trail and Rte. 70A. Portage Lakers will have a club ride and barbecue Saturday, March 24, at 9:30 a.m. Meet at Dean’s. Pleasant Ridge Riders Snowmobile Club will have a club ride down to the Blue Moose in Littleton on Saturday, March 24. Be at the clubhouse by 9 a.m. Cold Mountain Snowmobile Club will host a breakfast on Sunday, March 25, from 7 to 11 a.m. at the Grand Isle Community Center. Ashland Snowmobile Club will have a hot dog roast on March 31. Presque Isle Snowmobile Club Stew night Friday, 5 p.m., at the clubhouse. St. Francis Sno Angels will have their clubhouse open on Saturdays 11-7. Washburn Trairunners’ Clubhouse is open Friday 8-12, Saturday 7-2 and Sunday 7-12.